A “winning” (Parade) and “well-conceived” (The New York Times) account of one teenager’s solo trek to play golf in each of the lower forty-eight states—“two parts coming-of-age story, one part golf travel adventure, and one part survival test” (Golfweek). Shortly before his freshman year of college was set to begin, seventeen-year-old Dylan Dethier—hungry for an adventure beyond his small town—deferred his admission and, “like Jack Kerouac and Ken Kesey before him, packed his used car and meager life savings and set off to see and write about America” (ABC News/ Yahoo). His goal: play a round of golf in each of the lower forty-eight states. From a gritty municipal course in Flint, Michigan, to rubbing elbows with Phil Mickelson at Quail Hollow, Dylan would spend a remarkable year exploring the astonishing variety of the nation’s golf courses—and its people. Over one year, thirty-five thousand miles, and countless nights alone in his dusty Subaru, Dylan showered at truck stops, slept with an ax under his seat, and lost his virginity, traveling “wherever the road took him, with golf as a vehicle for understanding America” (The New York Times). The result is a book that “would be considered fine work by any writer, let alone one so young” (Maine Edge). Dylan Dethier is a native of small-town western Massachusetts. He learned to golf on a shoes-optional par-30 course near his grandparents’ house on the Maine coast. Dethier is now an English major at Williams College. 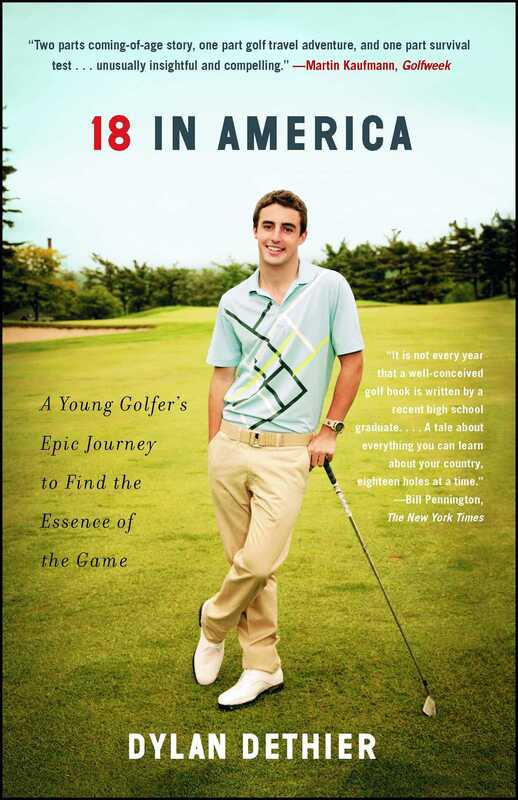 “Whether showering in truck stops, meeting Phil Mickelson and Michael Jordan, or playing at Sawgrass and Pebble Beach, the simple story of 18 in America is filled with youthful enthusiasm, honest and sincere. It's a lovely road story well told. Discover a young golf Kerouac on the road, teeing off all across America and loving it." "A great coming of age tale based around the most epic of golf trips. A quick and easy read that does not disappoint." "It is not every year that a well-conceived golf book is written by a recent high school graduate... Sleeping in his car, showering at truck stops and raiding free motel breakfast buffets, Dethier played wherever the road took him, with golf as a vehicle for understanding America. He played with autoworkers and livestock auctioneers, and his 32,000-mile trek became a tale about everything you can learn about your country 18 holes at a time. It was a journey that was much more than a golf trip." "Intriguing... more than his share of unpredictable episodes that make for good reading." “Two things will piss you off about this book. First of all, Dethier is a better golfer than you or me. Second of all, he is a better writer than you or me…. A heartfelt, introspective, coming-of-age story, Jack Kerouac meets Jack Nicklaus." "This would be considered fine work by any writer, let alone one so young." "[A] winning memoir, which transcends golf’s elitist image, exposing the generous, diverse, and contradictory soul of the game—and of America itself." "Like Jack Kerouac and Ken Kesey and a host of others before him, Dethier packed his used car and his meager life savings, and set off to see and write about America.... Encounters with hustlers and thieves aside, what resonates in “18 in America” is Dethier’s optimism, and his talent for perceiving and telling of the good in things, be they golf or people." "It's not the brushes with greatness (including caddying in a pro-am with Phil Mickelson) but the goodness of ordinary people that make his journey so memorable--for him and for us."